INON strobes are very dependable, which means that any problems with them are usually what we as tactfully as possible call ‘user error’. If you are an experienced underwater photographer, you are probably already familiar with this concept – few of us survive our careers without forlornly pouring the seawater out of a much-loved camera at least once. So here are a few tips for keeping your INON strobes trouble free. Strobes can generate a lot of heat and that has to be dissipated to prevent it damaging internal components. The advent of digital has meant people are used to shooting sequentially – firing rapidly to try and capture the moment. In the days of film, with 36 exposures being the usual limit per dive, sustained rapid firing was unusual. Moreover, few underwater strobes could recycle in under 4 to 6 seconds, reducing the build up of heat and providing some cooling off time, and also ensuring lots of missed pictures! 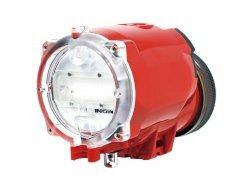 INON’s three strobe models, the S-2000, D-2000 and Z-240 all recycle in under 2 seconds, even when fired at full power. At lower powers, they literally recycle in a split second. As with professional land flash guns, there are limits laid down in your manual regarding how many shots can be taken before the strobe must be rested and allowed to cool. It is very important to observe these limits. If you overheat any underwater strobe or land flash, the resulting damage will not just put that strobe out of action for the rest of your trip, it may not be repairable. It is good practice to test your strobe system is all working properly before you dive. However, allow plenty of time for your strobe to cool down between test flashes. If you are using a strobe with a modelling light built in, there are limits regarding how long this can be left on safely – please check your manual. 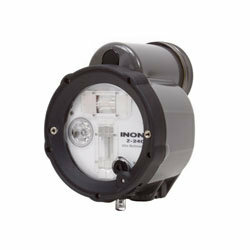 The INON battery chamber has a well thought out sealing mechanism. The O ring is bright yellow, making it easier to see debris that might have got onto it, but you do have to look. The cap is transparent, so you can easily check that the O ring is properly seated after you screw the cap into place. Two reasons we have seen for floods through the battery chamber are not maintaining the O ring regularly and using the wrong grease. It is important you regularly open up your battery chamber and remove and clean the O ring and clean the mating surfaces. With new battery technology, you can do a lot of dives before needing to change batteries. Even so, you must still maintain the battery compartment seals. Remember, your O ring is in contact with water and all the detritus it contains. This is why, when you run an O ring through your fingers after a dive, you can feel dirt and other particles on its surface. Detritus is what normally causes O rings to leak. Using the wrong grease can cause the O ring to swell and not seal properly. If you use a Z-240, you must also maintain the sync connector, even if you don’t use it because you connect via a fibre optic. If you don’t and the cap leaks, it will, short-circuit your strobe. If you use a hard-wired cable, you also need to maintain its O rings regularly, just like the seal for the battery chamber. Always maintain the housing socket as well. Not only do you risk leaks if you don’t, some housings have sockets that corrode, meaning your cable will become stuck into the connector. Whenever you disconnect a hard wired cable, hold your strobe or housing so that any trapped water drops fall away from the socket, not into it. It’s a good idea to check for leaks in the battery chamber or sync socket after you’ve finished with your strobe and before you pack it away until its next trip. At this point, also remove the batteries. Soaking your underwater camera equipment in clean, fresh water is important for preventative maintenance. Be careful of dip tanks at resorts and on boats, though. Often the water becomes quite salty, unless it is frequently changed. Another problem is that the water can become quite warm. This can cause the air in some housings to expand and the internal pressure can force the housing to open fractionally, causing a leak. Dip tanks can also become a bit of a bun fight. We advise only a quick rinse of your kit on leaving the water, then placing it somewhere safe. On returning home, it is good practice to let your system soak for 24 hours in cool, fresh water to leach out any salt. We suggest spending a few minutes operating all your camera and strobe controls underwater to help flush out the areas around control shafts. Do not add chemicals to the water – it can damage materials, including lens coatings. How long do INON strobes last if you look after them? We don’t know. We do know of a number of Z- 220 strobes, the model that became the Z-240, that are being regularly beasted by some very hard working professional underwater photographers. Those strobes are now nearly 20 years old. Ask us again in five years’ time! Don’t forget, the INON UK Level Two Lighting Course This is your opportunity to learn some fun advanced lighting skills to help you really make light work for you in your underwater images. INON UK's Understanding Your Underwater Camera and Strobe Course helps explain how the get the most from all those seemingly complicated camera and strobe functions. It all about putting you in control of your camera, strobe and photography.